I like Vitamin C Serums and have been using and testing them for a while now with great results. These serums hydrate and thereby reduce the amount of visible wrinkles on your face. Today, I am sharing about New York Biology L-Ascorbic Vitamin C Serum. According to the manufacturer L Ascorbic Acid is notorious for being expensive since it cost a lot to formulate to rapid oxidation. 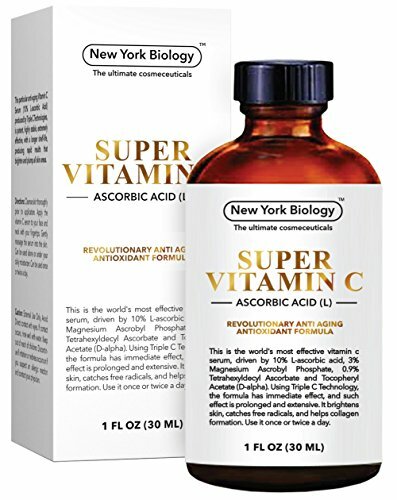 New York Biology claims that their lab has succeeded in keeping the L Ascorbic Acid stable for 12 months using their Triple C Technology. To be honest I have no idea how to go about proving the stability to the serum. However I can tell you what I think of the product. According to the manufacturer's directions the serum is to be applied every 8 hours to see results, in other words a healthier looking skin. The bottle comes with a dropper, smells nice - just a hint of a floral fragrance. The almost clear serum dissolves right into the skin, and you can apply your moisturizer and makeup soon after you have applied it. Make sure to avoid the sun and to use sunscreen, since your skin will be susceptible to sunburns when using Vitamin C serums. I have been using this serum and have noticed that the product does exactly what it promises. I do not have very deep lines, since I have been moisturizing like crazy. However I do feel my pores tightening up as soon as I apply the serum. My face looks healthy and radiant and therefore this product gets a thumbs up from me. MADE IN THE USA the topical Vitamin C serum is made using the Highest Quality Ingredients. This anti aging anti wrinkle serum, is produced in an FDA Approved cGMP Facility and does not contain parabens or sulfates and is Cruelty Free. Each Month the company make a "Small Batch" of the L Ascorbic Acid Serum. Almost 100% of the serums are sold via Amazon within 30 Days of the "Filling Date". Meaning that the consumer is buying "Always Fresh" and less Than 30 Days Old L Ascorbic Acid. The serum is available via Amazon.